The National Gallery, London, has recently acquired Still Life with Lemons, Lilies, Carnations, Roses and a Lemon Blossom in a Wicker Basket, the first work by Juan de Zurbarán to enter a public collection in the UK. 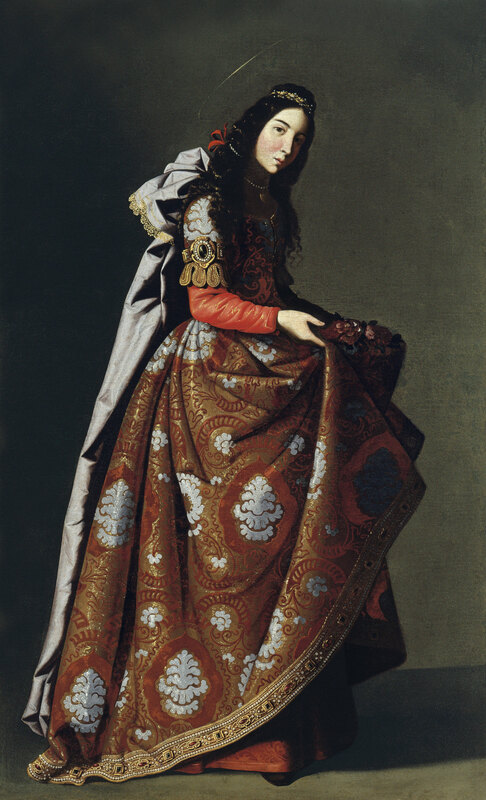 On display at the Gallery since 25 April 2018, the work was painted in about 1643–49 by the son of leading Golden Age artist Francisco de Zurbarán. Long overshadowed by his father, Juan was a skilled still life painter documented in Seville between 1620 and 1649. Works by his hand are extremely rare as his career was cut short at 29 by the plague which halved the city’s population. This entry was posted in News, Uncategorized and tagged Francisco de Zurbarán, golden age, juan de zurbarán, National Gallery London, new, new acquisition, Painting, Seville, still life, The National Gallery on May 7, 2018 by costanzabeltrami. From 10 October 2015 to 31 January 2016 paintings by Francisco de Zurbarán will be shown for the first time in the German-speaking world in a monographic exhibition, organised by the Museum Kunstpalast, Düsseldorf in cooperation with the Museo Thyssen-Bornemisza, Madrid. Zurbarán’s work is barely represented in German collections, and while internationally his work has been discussed from many different perspectives, there has only been a limited amount of art historical research on it in Germany. Intermediality. Early Zurbarán reception already emphasised the sculptural qualities of his paintings but more recent research has shown that the interrelation of painting and sculpture in seventeenth-century Seville cannot be understood from the context of contemporary art historical discourses alone, and we should also consider techniques and workshop practices in these two genres. This perspective could be broadened by considering Zurbarán’s place in a history of piety and exploring the role that his canvases played in paraliturgy. Another area of research would be the interplay of body, space and materiality for the perception and reception of the sacred and the divine secrets of faith in each genre. Zurbarán’s paintings are remarkable in their way of evoking the surface texture and haptic qualities of the many different materials used, which often, for example in the garments, enter into a dynamic relationship with the bodies perceived as holy. The conference would like to offer the possibility of discussing different approaches to this phenomenon, for example from the perspective of visual culture studies, image studies, costume history and textile history but also that of restoration. Narrativity. Zurbarán’s tendency to focus on the essential and his ‘iconographic’ condensation of motifs have been stressed repeatedly. But his works also contain seemingly marginal details: still life elements in religious scenes, or the signs of Christ’s Passion on his body that are barely recognisable in the dark background. These elements may not reveal themselves at first sight, which is why the conference also wants to explore the role of the seemingly inconspicuous for the perception and interpretation of Zurbarán’s paintings. New contexts of perception and experience. Francisco de Zurbarán’s era was shaped by great upheavals in both church and state politics. We thus need to explore how art positioned itself in a society undergoing profound social and cultural change. Possible themes here include art production, which had to address the market challenges in the New World, as well as pictorial subjects and their treatment, such as t ambivalence of the ‘nature morte’ in religious art. Reception. Finally, the conference would like to encourage scholars to examine the rather belated recognition of Zurbarán in German art history within the broader context of the history of his critical reception, and to ask which ideas, images and myths art historians in different countries have associated with his work. We welcome proposals which address one or more of these themes or other fields of enquiry. The conference will be held in German, Spanish and English. Grants to assist speakers in their travel and accommodation costs may be available but this has not yet been confirmed. This entry was posted in Call for Papers, Conference, Spanish Art and tagged 2016, Carl Justi-Vereinigung, Düsseldorf, Francisco de Zurbarán, Reception, Spanish Art on July 27, 2015 by Clare Hills-Nova.